8:30pm update: Due to the weather forecast of anticipated snow across the county, all PUSD schools will be closed on Thursday, March 1st. 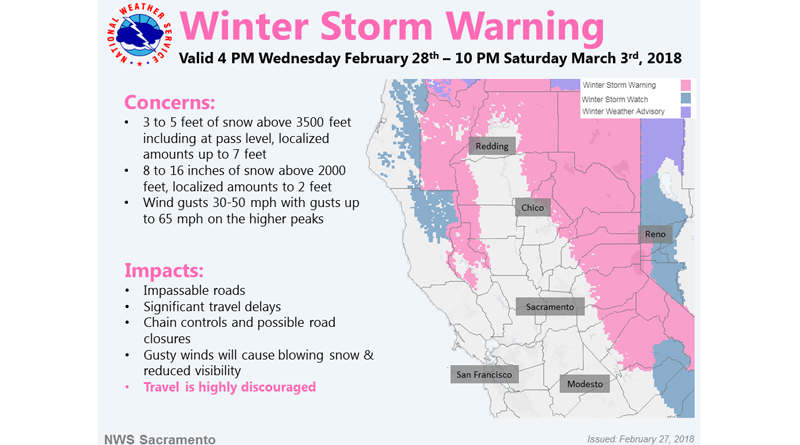 A winter storm warning is in effect from later today through this weekend. 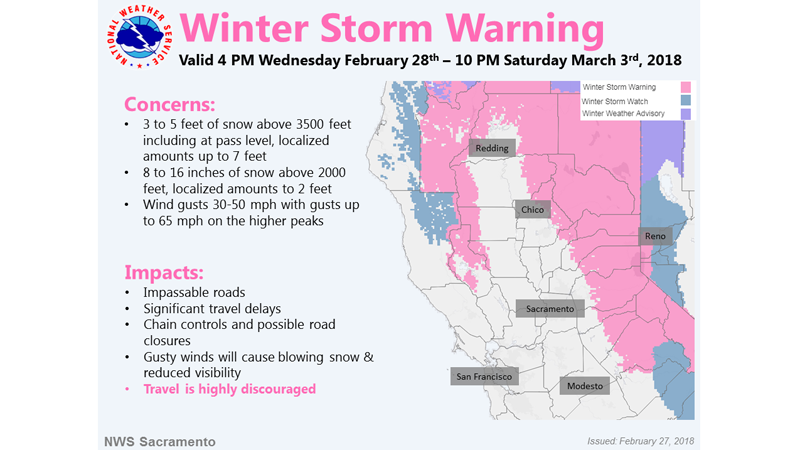 Multiple agencies — including the local Office of Emergency Services, PG&E, the CHP and local fire districts — are warning residents to be prepared for heavy snow and wind, which will lead to treacherous driving conditions and the potential for widespread power outages. 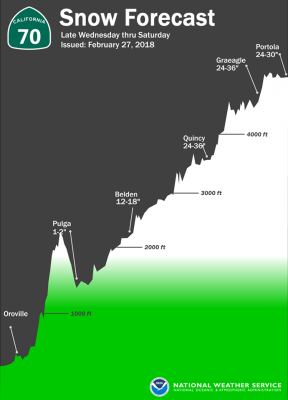 Two to three feet of snow is forecast for most the county. With wind gusts of 45 to 65 mph, falling trees are another possibility. Plumas Unified School District officials are monitoring the weather closely and will determine day by day whether school will be canceled or start on a delayed schedule. Parents will be notified through the school messenger service to alert them of any plans. As of now a decision has not been made regarding Thursday and Friday. · Never touch downed wires: If you see a downed power line, assume it is energized and extremely dangerous. Do not touch or try to move it—and keep children and animals away. Report downed power lines immediately by calling 911 and by calling PG&E at 1-800-743-5002. · Use flashlights, not candles: During a power outage, use battery-operated flashlights, and not candles, due to the risk of fire. If you must use candles, please keep them away from drapes, lampshades and small children. Do not leave candles unattended. · Have a backup phone: If you have a telephone system that requires electricity to work, such as a cordless phone or answering machine, plan to have a standard telephone or cellular phone ready as a backup. · Have fresh drinking water, ice: Freeze plastic containers filled with water to make blocks of ice that can be placed in your refrigerator/freezer during an outage to prevent foods from spoiling. Blue Ice from your picnic cooler also works well in the freezer. · Secure outdoor furniture: Deck furniture, lightweight yard structures and decorative lawn items should be secured as they can be blown by high winds and damage overhead power lines and property. · Use generators safely: Customers with standby electric generators should make sure they are properly installed by a licensed electrician in a well-ventilated area. Improperly installed generators pose a significant danger to crews working on power lines. If using portable generators, be sure they are in a well-ventilated area. · Turn off appliances: If you experience an outage, unplug or turn off all electrical appliances to avoid overloading circuits and to prevent fire hazards when power is restored. Simply leave a single lamp on to alert you when power returns. Turn your appliances back on one at a time when conditions return to normal. · Safely clean up: After the storm has passed, be sure to safely clean up. Never touch downed wires and always call 811 or visit 811express.com at least two full business days before digging to have all underground utilities safely marked. Bring it on Mother Nature. As a reminder, there is a Plumas County Ordinance that states that vehicles left parked on the street that are hindering snow removal shall be towed at owner’s expense. Please be responsible and park your vehicle off the street. The Plumas County Road Department has enough trouble plowing these narrow streets here in Quincy, lets help the Community. forcasted 4-8″ lastnight, got about 2. A big bust. Had one inch last night.